J & R Lamanchas Voss Eros , combined strength and width of the chest floor with smoothness. 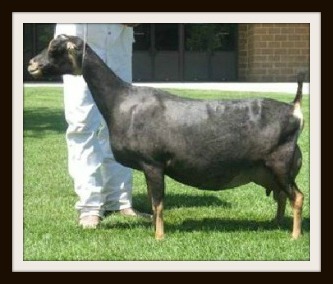 He placed first in all six rings at the 2014 Fall Frenzy Buck Show in Neosho, Mo. He took one Jr. Championship along with four Reserve Jr. Championships. Pictured to the right is his SGCH dam "Ellie Mae" . Thank you to J & R Lamanchas for the use of your photo of Eros' dam. Sadly we lost Eros last winter due to a stupid accident, but we were blessed with 6 doe kids from last falls breedings to him.